Wallyball is a fast, dynamic and exciting sport that is played by both male and female sexes as well as a wide range of ages. Also known as 'rebound volleyball', it is a close relative of volleyball, and shares many rules, techniques, plays and features. However there are some fundamental differences, the main one being that players are allowed to utilise the walls and ricochet the ball off there. This makes it a particularly fast paced sport and one that demands a great level of fitness and hand/eye coordination. The sport of Wallyball is often thought to have been created by Joe Garcia, but it was actually devised by a gentleman known as Bill Dejonghe from the Calabasas Racquetball Club. Faced with falling numbers using the club in summer, he devised the game as a way to help bring more business in. Joe Garcia was involved in the early days as he was the club’s professional and it was he that popularised the game and took it into the mainstream and is largely responsible for its success today. The game now has its own designated rules and regulations, is played in nations across the world and is overseen by the American Wallyball Association. The object of Wallyball is for one team to beat their opposing team by scoring more points than them. 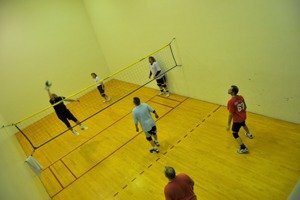 Players do this by playing what is essentially a normal game of volleyball but on a racquetball court where it is allowed to hit the ball off the walls. Many of the traditional strategies used in volleyball can work in wallyball to help ensure a team’s victory, such as defining specific defensive and attacking duties and utilising a wide variation of the number of touches used before hitting the ball over the net. However, techniques to place any type of curve on the ball are largely outlawed, such as spiking or the paintbrush technique. Spin is allowed, but only if done so by hitting the ball off centre. Wallyball is played with between two and four players per side, according to the American Wallyball Association, although it can be played by more. The organisation tasked with promoting Wallyball around the world has expanded the rulebook to include rules for games where there are five or six players on each side. The equipment needed to play Wallyball is minimal, and really only consists of a court and a ball. Wallyball is played on a racquetball court and so is 40 feet by 20 feet with a dividing line in the middle of the court and a net that is 3 feet high. The ball used in Wallyball should be between 25 and 27 inches and weigh between 9 and 10 ounces. A regular volleyball can be used as they fit these stipulations perfectly. Scoring in Wallyball is similar to that used in Volleyball, but is slightly different and is called speed scoring. Essentially, whereas in volleyball you score on every point, in Wallyball you only score when serving. Points are scored on each service up until one team reaches what is known as the freeze point. The freeze point is three points less than the number of points needed to win the game and when this occurs, a point is awarded on the next side-out and to score further points, each team must serve. Although this method of scoring is very familiar to anyone with experience of volleyball, it can take some getting used to for outsiders. However, once seen in action, it becomes very clear and its simplicity and effectiveness can be seen. A match of Wallyball is won when one team reaches the required number of points to win the game, which can be 15, 18 or 21 points depending upon the game. Teams must also win by two points, which means that some games can go beyond these point limits. All games of Wallyball are played on the basis of the first team to 15/18/21 points and is two points ahead is declared the winner. The number of points is determined by the game/league/tournament that the match is being played in. All games of Wallyball should be played on an official raquetball court, complete with all relevant markings and a net 3 feet above the ground across the centre of the court. All matches shall consist of the best two of three games. All players should wear the correct attire which is shorts, t-shirts and training shoes. Each team will be comprised of two, three or four players. Each team is permitted two time-out period of 30 seconds per game. Before the match, a coin is tossed to ascertain which team will serve first or choice of court side. Service is played by striking the ball with one hand or any part of the arm in an attempt to send the ball into the opposition's side of the net. The service order must be kept throughout the fame. The ball shall be called out of bounds whenever the it hits the opposition’s back wall or the ceiling. Any ball that touches or rebounds off the net may be played again, unless it was not the serve. Players should not touch any part of the net whilst the ball is in play. Do so and it shall be called a fault. When playing the ball, each team are allowed up to three touches before playing the ball over the net into the opposition's half. Players are not allowed to hold the ball, lift it, scoop it or carry the ball and will be called a fault if they do so. The defending team may block the ball when the ball is served by the opposition or they spike the ball or have made three contacts with the ball. All players should conduct themselves in a sportsmanlike way.